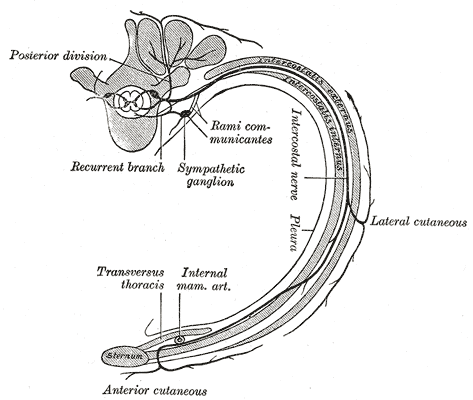 The spinal nerves branch into the dorsal ramus, ventral ramus, the meningeal branches, and the rami communicantes. The dorsal and ventral rami contain nerves that provide visceral motor, somatic motor, and sensory information, with the dorsal ramus feeding the dorsal trunk (skin and muscles of the back), and the ventral ramus feeding the ventral trunk and limbs through the ventrolateral surface. The meningeal branches supply nerve function to the vertebrae themselves, including the ligaments, dura, blood vessels, intervertebral discs, facet joints, and periosteum. The rami communicantes contain autonomic nerves that carry visceral motor and sensory information to and from the visceral organs. nerve plexus: A branching network of intersecting nerves. dorsal ramus: The posterior (or dorsal) branches (or divisions) of the spinal nerves are, as a rule, smaller than the anterior divisions. They are also referred to as the dorsal rami. They are directed backwards and—with the exceptions of those of the first cervical, the fourth and fifth sacral, and the coccygeal—divide into medial and lateral branches for the supply of the muscles and skin of the posterior part of the trunk. meningeal branches: Also known as recurrent meningeal nerves, sinuvertebral nerves, or recurrent nerves of Luschka, these are a number of small nerves that branch from the spinal nerve (or the posterior ramus) near the origin of the anterior and posterior rami. They then re-enter the intervertebral foramen, and innervate the facet joints, the annulus fibrosus of the intervertebral disk, and the ligaments and periosteum of the spinal canal, carrying pain sensation. Course and branches of thoracic spinal nerve: This diagram depicts the course and branches of a typical thoracic spinal nerve. The posterior division (dorsal ramus) is labeled at the top right. Outside the vertebral column, the spinal nerves divide into branches. The dorsal ramus: Contains nerves that serve the dorsal portions of the trunk carrying visceral motor, somatic motor, and sensory information to and from the skin and muscles of the back. The ventral ramus: Contains nerves that serve the remaining ventral parts of the trunk and the upper and lower limbs carrying visceral motor, somatic motor, and sensory information to and from the ventrolateral body surface, structures in the body wall, and the limbs. Some ventral rami merge with adjacent ventral rami to form a nerve plexus, a network of interconnecting nerves. Nerves emerging from a plexus contain fibers from various spinal nerves, which are now carried together to some target location. Major plexuses include the cervical, brachial, lumbar, and sacral plexuses. The meningeal branches (recurrent meningeal or sinuvertebral nerves): These branch from the spinal nerve and re-enter the intervertebral foramen to serve the ligaments, dura, blood vessels, intervertebral discs, facet joints, and periosteum of the vertebrae. The rami communicantes: Contain autonomic nerves that carry visceral motor and sensory information to and from the visceral organs.